Lace up your walking shoes for an insiders’ journey into great restaurants. FOR ME, travel is almost exclusively about the food. I’m that tourist who jabbers away about the incredible hints of charcoal on the crust of mouthwatering wood-oven pizza, only to look up and notice, “Oh hey, is that the Leaning Tower of Pisa?” Yes, I’m ridiculously obsessed with food, and that’s how I ended up spending a few days on the streets of Santa Fe following a few of New Mexico’s growing number of food tours—an outstanding way to experience a place, whether you’re a first-timer or an old-timer, a gourmet or a gourmand. I sampled posole, fennel risotto, and margaritas, chatted with chefs, chocolatiers, and distillers, made friendships with fellow travelers, and saw a town I thought I knew with fresh eyes. 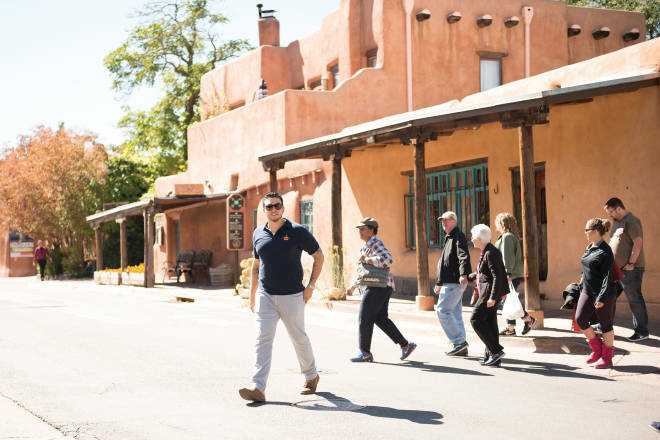 Founded by Santa Fe native Nick Peña in 2011, this is the state’s most established food tour outfit, offering up to four jaunts daily in Santa Fe and Albuquerque. I meet the Taste of Santa Fe Lunch Tour at its starting point, the San Francisco Street Bar and Grill, where guide Carlos Zozaya holds a group of six out-of-towners in rapt attention as he delivers a primer on red and green chile. The table bears plates of miniature enchiladas, slathered with a little of both chiles, and glasses of margaritas. Zozaya imitates his grandmother on the phone, saying, “Hey, Hito! I just picked up 150 pounds of green chile,” and playfully groans because if he doesn’t help peel it, he won’t get any for his own freezer. He explains, in a breezy way, how the peeled chile pods become a sauce like the one we’re devouring. It’s part memoir, part cooking show, and we are charmed. Zozaya, a former restaurant chef who grew up in Belén, keeps up a lively, informative banter as we walk across the Plaza, heading for Santacafé. (The restaurants on the tours change, as do the dishes.) We meet the owner, who leads us to a glass-covered well shaft and tells the building’s history. The chef brings out little cups of tomato-basil soup, followed by a farmers’ market salad and the restaurant’s signature Southwestern egg rolls. My fellow tour-goers, two bird-watching couples and a pair of friends from California on a birthday trip, sip pinot grigio, which, on top of the margaritas, makes us feel festive. At Osteria d’Assisi, the owner and his son tell us what we’re about to eat: house-made polenta, local broccoli, and creamy burrata drizzled with a balsamic glaze. One of the birders, raving about the wine (a lesser-known Italian white called Molamatta) snaps a picture of the bottle. By the time the tiramisu arrives, I deeply regret devouring that earlier plate of enchiladas. Be wise: Pace yourself—and plan for a late-afternoon nap. As we walk to the next stop, I chat with interior designer Jana Maginetti, who signed up for the tour because her girlfriend suggested they do something “wild and wacky” on her first trip to Santa Fe. “If we were just walking around on our own, we’d never know any of this stuff,” she says. We duck into the Santa Fe Olive Oil and Balsamic Company for a tasting, then the Inn and Spa at Loretto, stopping at Liquid Outpost for a coffee on the way to Kakawa Chocolate House. By the time we part, I feel like I’ve gained three pounds—and half a dozen new friends. 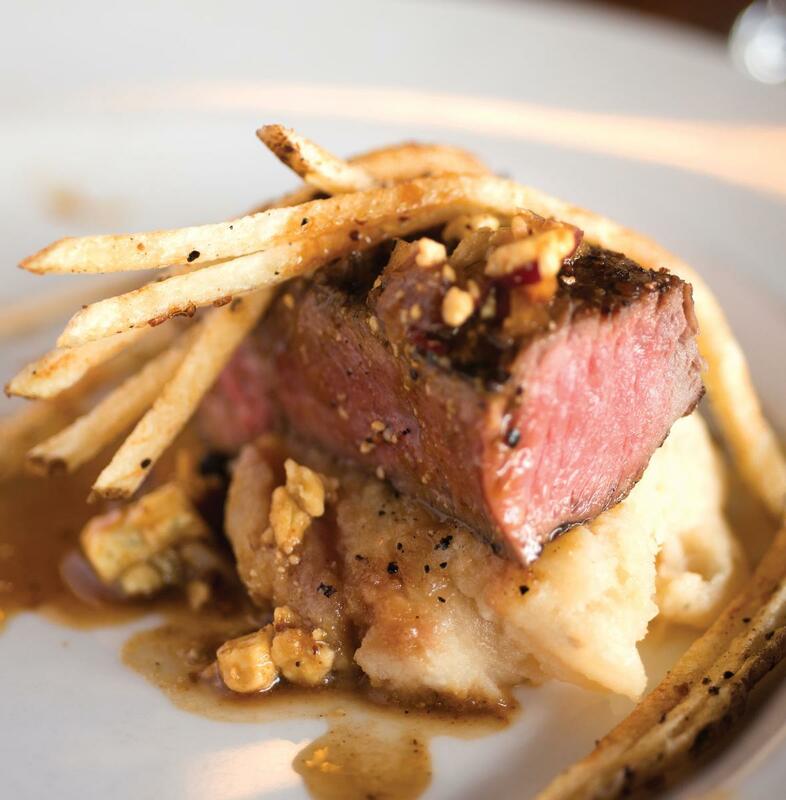 Above: Steak beckons at Dinner for Two. Wander is a newer company offering a walking tour of the revitalized Railyard area. It focuses not on Santa Fe’s 400-plus years of history, but the 14 decades since the iron horse arrived. Mix history and face time with chefs, restaurant owners, brewers, and distillers and you get Wander. Owner and guide Joe Griffith instructs participants to meet him under the iconic water tower, where he flips through a stack of historic photos showing what the Railyard looked like in the past. We scan back and forth from the pictured warehouses to the renovated SITE Santa Fe, Farmers Market Pavilion, Violet Crown Cinema, and REI. We walk through Railyard Park as Griffith describes its transformation from forgotten wasteland and leads us past the waffle garden, explaining how Pueblo people shaped the land to make the most of scarce water. State Capital Kitchen is closed when we arrive—it only serves dinner—but we glide right in. The sommelier greets us with glasses of French rosé, and the sous-chef passes out a masterful risotto with shaved fennel, braised fennel, fennel pollen, and Parmesan cheese. He chats with the group for a while about sunchokes and then brings an extra sample of a sunchoke salad with hazelnuts, pink peppercorns, and pickled butternut squash. We’re wowed. We mosey around the corner to the Santa Fe Spirits tasting room for thimbles of its distinctive Colkegan whiskey, Wheeler’s gin, and Atapiño liqueur. The tour finishes with Chimayó-chile mussels at Cafe Sonder, which brings the theme full circle. The owners of the Plaza Cafe, the oldest restaurant in town, opened Cafe Sonder in 2016 in the former home of Zia Diner, a former railroad warehouse. Walking back toward the Plaza after the tour feels like a different journey, the warm burn of chile still tingling my lips and the Santa Fe’s railroad history fresh in my mind.